The relationship between two variables can be visually represented using a scatter plot and will provide some insight into the correlation between the variables and possible models to describe the relationship. There are different ways to produce scatter plots in R making use of either the base graphics system, the lattice graphics library, ggplot2 or other packages. 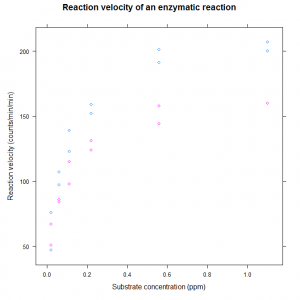 The R system has various data sets available for analysis, for example the Puromycin data which describes an experiment to study the relationship between reaction velocity and substrate concentration in an enzymatic reaction involving untreated cells or cells that were treated with Puromycin. An alternative would make use of the panelling facilities in lattice graphics to plot the data for the treated and untreated cells separately.